Prime your closet for more color with this series of guides for bold shades. SG HQ is breaking down how to wear stylish hues (like how to wear goldenrod!) with easy color combinations and outfit ideas for guys. Catch up on how to wear bright blue, amber, lavender, army green, salmon, slate, orange, teal, khaki, burgundy, red, cobalt blue, mint green, pale orange, yellow and navy. We’re here today to try to convince you to wear more goldenrod. This color, named for the goldenrod plant (duh, right? ), is a deep, bright yellow-y orange, similar to amber. According to InStyle, “This golden glow provides an instantly sunny look to its wearers, no matter the weather or season.” We’re rechristening it Golden Eye in honor of the James Bond film (and even better James Bond video game). Note that we’re not advocating for you to suddenly start sporting brassy chain necklaces or those Versace knockoff faux-silk shirts (you know the ones we’re talking about). We’re talking about the color here, not the metal. Goldenrod goes great with all kinds of greens. From army green to blue-green turquoise. The warm shade also looks stylish when juxtaposed against neutrals like navy, black, beige, and grey. SG Says: Style blogger Patrick Janelle shows how well this color looks against a neutral background. In head-to-toe grey with black boots, his goldenrod jacket really pops. Goldenrod looks terrific paired with a multitude of colors, but we’re especially into it for spring with bright shades like turquoise and bluebird. We love the look of a sleek gold tie with a navy suit and a bright blue pocket square—but we also wouldn’t say no to gold embroidery on an otherwise plain tee paired with army green pants. SG Says: On the weekends, goldenrod looks great in a casual outfit like this corduroy shirt jacket with a white tee and black jeans. SG Says: Ooh boy, do we love a sweater in a sunny goldenrod hue. With dark denim jeans, it’s the perfect off-duty look. SG Says: What did we tell you! And with those burgundy twill pants? Yessir. 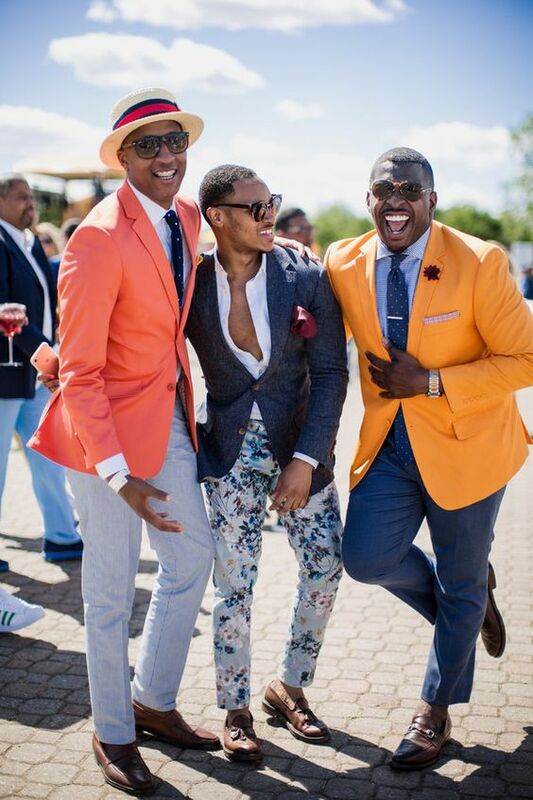 SG Says: We spotted this stylish guy at a polo match a few years back and just loved his bright yellow-y orange sport coat. And it looks great against the blue tones of his outfit. Ready to add more color to your closet? > Follow Style Girlfriend on Pinterest to see more outfit ideas and wardrobe must-haves.